Douglas County attorney Lance Ingalls said the withdrawal of the application ends the process completely. If the developers decide to resume work toward approval of the project, it would require a completely new application, Ingalls said. It was not clear why Penley Water pulled the plug. Officials for Penley Water could not immediately be reached today for comment. More Penley Dam Project coverage here. 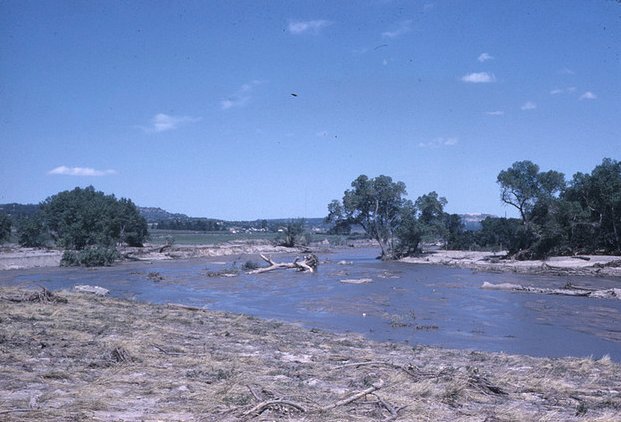 On Tuesday, Penley Water Co. [Chris Fellows] called the reservoir essential for weaning Front Range suburbs from wells, which produce less and less water as underground aquifers are depleted. The proposed $105 million reservoir would inundate about 306 acres west of Sedalia and hold up to 22,500 acre-feet of water. That’s slightly larger than Denver Water’s Marston reservoir. State records show 18 pipeline companies have been formed to move water in and out of Penley reservoir. These would connect Penley to Colorado Springs, Castle Rock, Highlands Ranch and other Front Range locations. Commissioners cited public safety and potential hazards among the reasons for their unanimous vote against Penley Reservoir. Their decision came after three nights and 11 hours of public hearings, where nearly 90 people spoke out against the proposal. 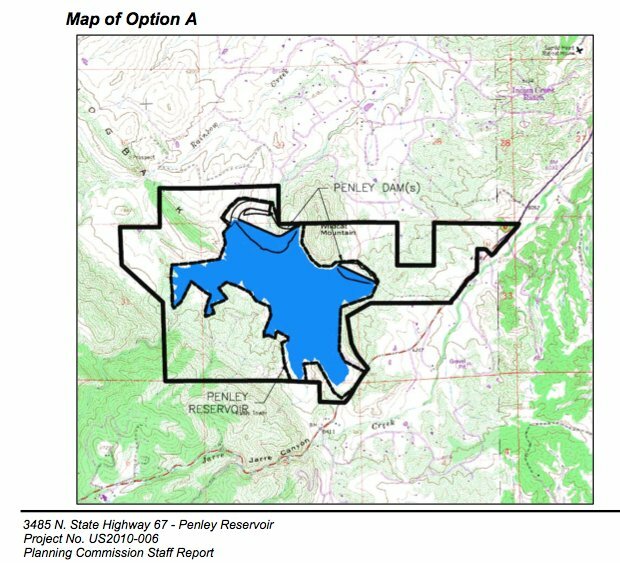 Penley Water Company is seeking county permission to build a reservoir just north of Colorado 67, adjacent to the Indian Creek Ranch subdivision. The applicant submitted a proposal with two options, one of which is a 22,500 acre-foot water storage reservoir on nearly 430 acres. Neighboring residents joined forces to attend the planning commission hearings and deliver the message that such a proposal could hurt their property values, destroy natural habitat and create an unnecessary safety hazard. The proposed dam site is on a site that requires detailed geotechnical and geological investigations to address potential hazard mitigation issues, according to the planning department staff report. The Douglas County planning staff recommended approval of either option, with conditions. The reservoir is proposed as a water storage solution for area water authorities. The developer came to the county with two options, a smaller, 14,000 acre-foot reservoir covering 292 acres or the larger reservoir covering about 430 acres. While Ventana’s umbrella corporation, the Penley Water Company, moves forward with a proposal for the reservoir, no plan has been submitted for a proposed subdivision near the site. The Penley Dam is situated to overlook houses in Indian Creek Ranch, another subdivision of 5-acre lots. In November, residents in the Indian Creek area, near Sedalia, got together and organized an opposition group to Ventana Capital’s application for the Penley Dam Project, part of the proposed Penley Ranch development. The project’s effects on property values, aesthetics and possibly the flood plain were their main issues. In December the Douglas County planning staff recommended approval for the project and sent it on the the Douglas County Planning Commission. On January 10 the Commission voted unanimously (8-0) against the project, according to email from a Coyote Gulch reader. The Douglas County Board of County Commissioners hearing to consider a Use By Special Review application for 3485 N. State Hwy 67-Penley Reservoir (Project File No. US2010-006), noticed for Tuesday, January 25, 2011, at 2:30 p.m., is being continued to Monday, February 7, 2011, at 6:30 p.m. This continuation is necessary to accommodate the numerous requests from citizens for an evening hearing. Additional hearings are tentatively scheduled for Wednesday, February 23 and Thursday, February 24, 2011, also at 6:30 p.m. All project documents are available on the County’s website here. More Penley Dam coverage here. The county planning staff recommends the county approve two options for the developer to choose from, one of which could result in construction of a 22,500 acre-foot water storage reservoir on nearly 430 acres. The planning staff recommends approval of both options, allowing the developer to decide which of the two will move forward. Among the conditions of approval are recommendations to perform detailed geotechnical and geologic investigations, provide the appropriate federal and state permits and comply with U.S. Fish and Wildlife Service requirements for the Preble’s Jumping Mouse. The dam site is identified as a potential habitat for the endangered mouse, according to a referral response from the fish and wildlife service. Another referral agency, the Colorado Geological Survey (CGS), responded with concerns that the dam is proposed on a site underlain by a complex series of faults. The planning commission public hearing for the Penley Dam application continues at 7 p.m., Jan. 10 in the commissioner’s hearing room at 100 Third St. in Castle Rock. The reservoir would have no public use and would have a security fence to keep people out of the property, according to developers.